Elena’s Nature Collection is available on prescription at GPs’ discretion. This means there is no guarantee. It is important for patients to appreciate it is a privilege not a right to obtain a cosmetic organic handmade range on prescription. Elena’s Nature Collection has been known to the Pricing Prescription Authority (PPA) for 10 years. 11 products have their own PIP code. This enables the GP and the pharmacist to find the products easily. Orders dispatched directly to the pharmacy. Please phone orders through on 01435 884090 and we dispense instantly. Please phone or email for a FREE GP Information Pack. Simply click the order form (click and print). GPs and pharmacists will find the products listed on their software system. If they are on E-MIS look under “Elena’s Nature Collection” and on other software programmes such as Torex and Phenix (which are now Premier Synergy supplied by iSOFT and SystemOne supplied by CSC/TPP (the Phoenix Partnership)), under the name of each individual product. The products are also listed in the Chemist and Druggist Monthly (used by the pharmacist). Twelve years of research, working with people who also may be prone to eczema and psoriasis paid off. 1. Trinity all in one Soap and Shampoo: helps reduce the itch and is cleansing. Apply to your skin, leave on for 5-20 minutes, the longer the better! Shower off- bathing makes the skin dry, red, hot and itchy. Towel dry. 2. Ultimate Body Oil, which lubricates the skin, leave for a couple of minutes. 3. Day Cream Special during the day, known to regenerate the skin. 4. Night Cream Extra at night time known to improve the skin. Antibacterial, unique and therapeutic liquid soap and shampoo especially created to repair the skin, full of effective ingredients including Essential Oils of Camomile and Tea Tree. It is the kingpin of Elena’s Routine. Use daily as a shampoo for all types of hair, as a face mask, or for dry hands and feet. Very versatile! A blend of six oils especially chosen to lubricate, soften and permeate the skin. Elena’s Scandinavian advice is to use it after a shower directly massaging onto the skin, and use in the bath once a week. Mix it with the Trinity Soap and Shampoo for very dry scalp in adults and babies. Moisturising and soothing, use little and often, helps repair the skin. Contains Essential Oil of Lavender. Rich and calming,restores the skin through the night. Contains Essential Oil of Geranium. This took 8 years to develop and is an extremely substantial non-greasy cream intended to support the skin. a fantastic moisturiser for the older skin. Ideal around the eyes, ears and mouth, for hands and feet. Revitalising and top of the range. Eureka. A very rich moisturiser, easily absorbed by the skin. Developed for very fragile, infantile or older skin . Full of beneficial oils and minerals Superb for cuticles and the hands. Perfection. Also fantastic for the older skin. Amazingly thick and creamy. Use all over. Contains no essential oils hence odourless. Ideal once a day. A creamy antibacterial lotion. Use once a day in between using Day Cream Special. A good facial moisturizer for oily skin. Use Cleanser and Toner all-in-one twice daily and to remove make-up. Helps to reduce the red face look, e.g. weathered cheeks. Please note you should never apply moisturiser to an un-cleansed face. Use on a cotton wool pad. Soothing and lubricating, ideal for dry lips. The predominant oil is Monoi de Tahiti from the Gardenia flower. Sensuous. Full sun protection normally equates to Factor 50 (SPF). The product is made from powdered Titandioxyd in Jojoba Oil and provides UVA, UVB and UVC protection. Mineral based sunscreens are non-irritants and are suitable for babies and young children with sensitive skin. Suitable for all ages. Ask for sun Block guide sheet. Produced in Denmark. All the ingredients used are chosen for their individual therapeutic properties. When used in the correct quantities (as recommended by the manufacturers) they create the desired effect. All the products are produced by hand on Woodmans Farm in East Sussex. The ingredients are mixed at a constant temperature, without using homogenisation, which allows them to retain their therapeutic values. None of the ingredients or products have been tested on animals. 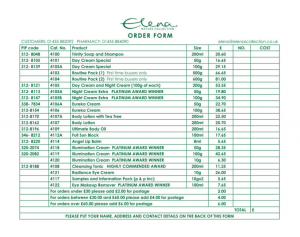 Elena’s customers have tried and tested the products over the past 25 years. Customer feedback has helped to create new products which have expanded the range. If you wish to see customers or Doctors letters received over the last 25 years please ask- email or phone 01435 882092.